If you have been offered a job teaching English as a foreign language overseas it is likely you will need to legalise the appropriate qualification. We are pleased to assist hundreds of people every year with their important certificates. 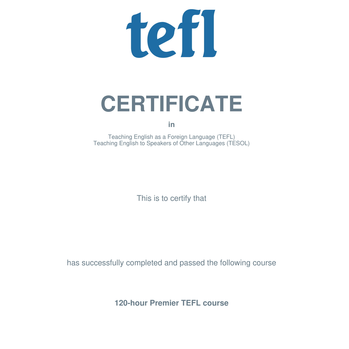 For only £66 we arrange for your TEFL certificate to be issued with the apostille. We can legalise either the original certificate or a copy thereof. Many countries will accept a certified copy of your document. However, we do recommend you check if a copy will be accepted by the organisation asking you to get your document legalised. Some countries are now requesting original documents have the apostille. If the document was issued electronically the document can be emailed to us and this will be certified as a copy. Please indicate on the order form if you would like us to ‘APOSTILLE THE ORIGINAL’ or ‘APOSTILLE A COPY’ of the certificate. Which TEFL certificates can be legalised? We can only assist with the legalisation of TEFL certificates, and similar documents, that meet certain criteria. Only state that the document has been issued to confirm a ‘training course’ has been attended. For example ‘150 hours training course in teaching English as a foreign language’ or ‘150 hours TEFL course’. The certificate cannot use any term that might imply that is is a qualification issued by a UK government recognised body. For example, the terms Diploma, Masters and Degree are not permitted. How to order an apostille for your TEFL certificate? Simply purchase your apostille online and post your document to us. This is the quickest way to obtain the apostille. If your document was issued electronically and the awarding body offers a document verification facility then you can simply forward the document to us via email. Once the document is issued with the apostille this will be recognised in countries that are part of the apostille convention. If the document is to be used in a country that is not part of the apostille convention then this may also need embassy attestation. Please contact us for advice if embassy attestation is needed.